Item SMUG-14SSW * 14 oz – These stylish stainless steel travel mugs come with a flip top for easy sipping. These are perfect for joggers, athletes, company promotions, educational fund-raisers and everyday use. Hand wash recommended. 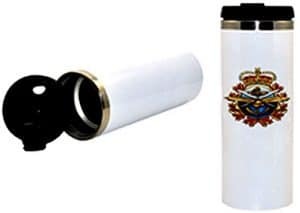 Item SMUG-15SSWP * 14 oz Stainless Steel Travel Mug inside and out – Stainless Steel Travel Mug w/white patch, featuring handle and removable sipping lid. Hand wash recommended. Complete with gift box. 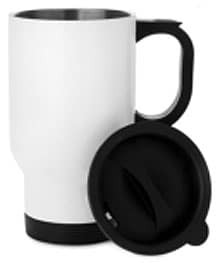 Item SMUG-15SSWT * 14 oz Stainless Steel Travel Mug inside and out – White Coating – Stainless Steel Travel Mug, featuring a black base, handle and removable sipping lid. Hand wash recommended. Complete with gift box. * Note: Be careful not to press so hard that the mug becomes deformed when the press is closed. • Not dishwasher safe – hand wash only. 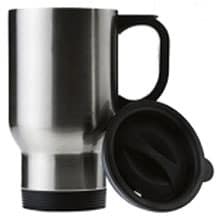 Allow water to fully drain from the hole in the bottom of the mug prior to storing or using the product. Shipped with the lids attached. Should a lid not fit after imprinting then the mug press pressure was too high. • If lids become separated from the original mug to which they were attached, you may find them not to fit. Should this occur, try other lids until you find the proper mate. Heavy pressure will cause damage to the mug’s handle anchor points allowing water to seep into the air-insulating cavity via cracks in these areas. This problem also can occur if the product has been washed in a dishwasher. A hole has been drilled into the bottom of the mug to allow the water to drain. 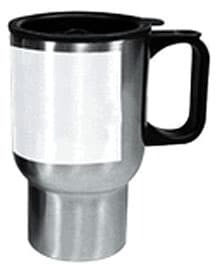 However, even under the best of circumstances, water may still find its way through the handle anchor points or the hole in the bottom of the mug. • Perform heat press imaging only. Placing a mug into an oven will cause the plastic pieces to melt. • Allow the mug to cool in open air — do not “dunk” them in water. You can accelerate the cooling process through the use of a fan blowing across the surface of the mug or by laying them down on a Cool Plate.